I've no idea what I'm going to do with this bike. 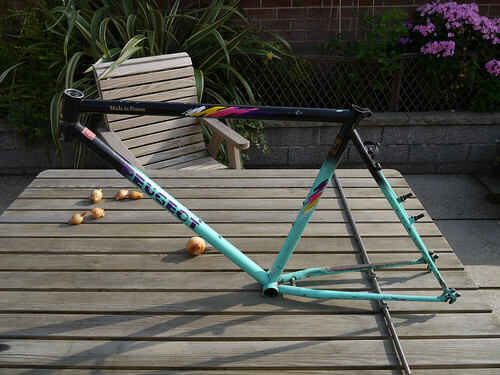 Actually, now, it's just a frame and fork as I've removed everything else and not much is fit to be re-used. The bike, a Peugeot Black Mamba ATB, is all I rode from the mid-1980s until 2008 when I bought a touring bike. It doesn't feel right just to throw it away or let it rust even more so I am going to do something with it. After tapping some rust out of the seat tube and chewing things over I have already made a couple of decisions. (1) A larger diameter wheel on the front. 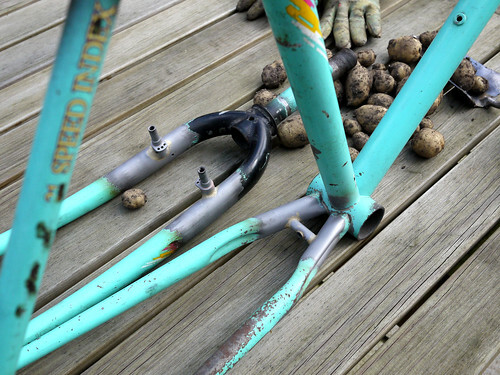 (2) Frame and fork will not be repainted. (3) Fit 'A-Head' type stem (not quill stem). I bought the bike in the mid-1980s as an 'ATB' (all-terrain bicycle) just before mountain bikes appeared on the UK mass market. I like 'ATB' as most mountain bikes never go anywhere near a mountain. The 531 frame has a traditional style horizontal crossbar (top tube) and also a very short stem, which means the bars are quite low, road racer style. A bit too low for me, which is why the quill stem is pulled out of the steerer more than looks right. A 700c road wheel on the front to replace the 26" MTB wheel will lift the head tube an inch or so, and I'm fitting a quill stem converter so I can use a modern A-Head stem angled upwards. This means I'll be able to fit an "oversize" 31.8 mm handlebar – lighter and stiffer than the old-style 21.4 mm (which are getting harder to find these days). I can't see any reason why 700c front can't be mixed with 26" rear but it means the front brake bosses need raising. This is currently with Neil Shankland, a frame builder and bike restorer who happens to be only a few miles away from me (so I discovered recently). Neil is also facing the head tube to receive a 1" Campagnolo Record threaded headset. 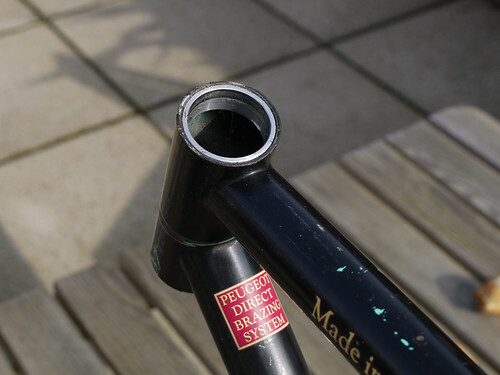 The head tube (above) appears to be large enough in diameter for a 1 1/8" steerer tube but it was internally sleeved by Peugeot for a 1" steerer. Removing the sleeves – the silver metal rings inside the head tube – would leave it too weak so I'm keeping the old fork (all steel and very strong, if rather heavy). 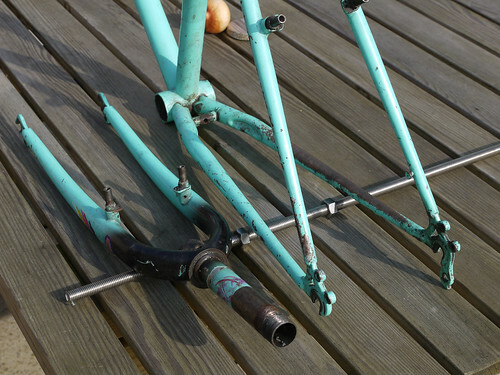 Fitting a modern threadless fork would mean not only removing the sleeves but reinforcing the head tube externally. It's too short for that and the work might weaken the joints at the top tube and down tube. Paintwork aside, and slight internal rusting at the base of the seat tube, this is a nice frame. The tubes are butted and jointed with Peugeot's direct brazing system with an internal brass fillet and no lugs. Visually, the joints are perfect and it's unusual to see no fillet (or weld) whatsoever on the outside. I have no reason to believe the frame is not pretty much as strong as the day it was built, although I need a way to prevent further rust inside the seat tube where water inevitably percolates past the seatpost. I might pour in some Kurust (Neil suggested oil) and drill a drain hole at the base of the tube. The only rust casualty is the chainstay bridge – he's brazing a new one on. 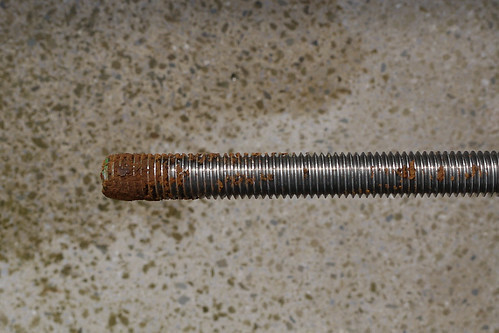 This bridge tube is a weak point on most steel bicycles because of the hole for the mudguard fixing bolt. Water easily gets inside the tube and under the paint at the edge of the hole. I think this is a poor detail; mudguards would be better with a clip over a protective strip. I admit the colour scheme is not attractive – very 1980s. The wear-and-tear doesn't help, yet that is what makes this bike so 'mine' in the same way as a pair of battered Levi jeans are so particular to their owner*. It remains to be seen whether the metaphor is valid for a bicycle, with patches of nondescript grey where there should be colour. It seems to work for Michelangelo so perhaps it will work for me! As for components, I'll wait and see how the frame turns out. *My brand new Ridgeback Panorama had a small paint blemish on the fork. It annoyed me at first and I bought some touch-up paint the exact colour but couldn't remove the blemish altogether. After a while I stopped bothering as new marks and scratches appeared on the frame. Now I don't care at all; in fact I like my 'evidence of use' on various parts of the bike. It does seem fitting that this bicycle is French. Posted by Patrick on August 23rd, 2012. A chap at the bike shop where I bought my Touristique from tried to explain to me what happens to steel-framed bikes over time. It was quite scientific, but ultimately it meant I had to buy another bike from him. Er, I didn't. 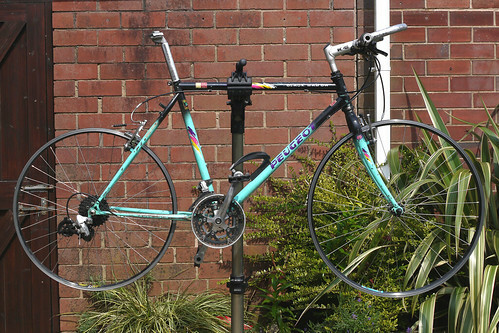 Sorry, but I think you should have the bike resprayed – and not just because of its current colour(s). I read somewhere that unless you are fitting mudguards you don't actually need a chainstay bridge. There's a hole (or two) in mine, but I've put a rubber seal around it and used a cable tie to fasten the clip at the end of the rear mudguard. Hmmm... well, I'd set my heart on a Michelangelo bike. What might happen to it Chris? (without chapter and verse will be ok) I mean, I will be spraying some paint on here and there. I just think that going to the all the trouble of getting new bits and braze-ons, but patching up the frame with a splodge of paint here and there would be like getting a shower and shave and then putting yesterday's clothes back on. Right... I thought you meant what the chap at the bike shop said. Good point anyway. It won't just be a splodge of paint though. Apologies if I gave a different impression. I'm aiming to do this very carefully, probably over the whole winter, and I do actually care what it looks like, but I'd like a 'worn' look that preserves some of the old combined with some neutral areas – or something. I've not really worked it out yet and I need to find out about bike paint. Chris: what did you use for the rubber seal for the chainstay bridge? I was thinking about doing something similar on a new steel road bike.